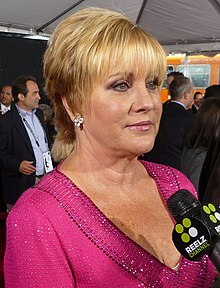 Lorna Luft (born November 21, 1952) is an American actress and singer. She is the daughter of singer and actress Judy Garland and producer Sidney Luft, and half-sister to singer and actress Liza Minnelli. Luft starred in the 1981 national tour of They're Playing Our Song and in 1982 she played Paulette Rebchuck in Grease 2. In 1983, she played Peppermint Patty in the Off Broadway production of Snoopy!!! The Musical, a sequel to You're a Good Man, Charlie Brown. In movies, Luft has appeared in Grease 2 (1982), Where the Boys Are '84 (1984), 54 (1998), and My Giant (1998). She and her brother, Joey, made cameo appearances in the 1963 movie I Could Go On Singing. In March 2018, Luft was diagnosed with a brain tumour after collapsing following a London performance. ↑ "Lorna Luft diagnosed with brain tumour after collapsing". The Guardian. Manchester. Press Association. March 10, 2018. Retrieved 2018-03-11. This page was last changed on 7 April 2019, at 11:17.